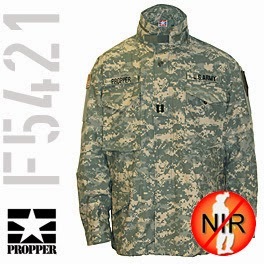 The ACU jacket by Propper™ is a military-issue field jacket that is approved for dynamic duty use in the U.S. Army. ACU jackets are becoming increasingly popular for both military and civilian use due to the jacket's exceptional functionality and features. Propper put a lot of time and effort in design the standard-issue ACU jacket. The demand for these ACU jackets for sale extends for beyond military use, as hunteres and outdoorsmen also utilize the ACU jacket from Propper for various applications. The ACU jacket is made from a NIR-approved rip stop fabric that constitutes 50% nylon and 50% cotton blend. It also has an adjustable fit thanks to the hook and loop sleeve cuff closures. The sleeves also have a three-pen pocket and other minimized shoulder pockets that allow the jacket fit best with an Outer Tactical Vest (OTV). The pockets and pouches of ACU jackets are military designed specifically for military purposes. This ensures that equipment and other necessary military gadgets are carried around with ease and comfort. The felled seems throughout the jacket make it strong and resistant to tear. This ensures that the jacket can come through any situation or event while still in perfect condition. The resistance of the jacket to fade means that it can withstand exposure to a number of weather elements. The ability not to shrink and wrinkle also helps in supporting the durability of the jacket. This means that it can be washed and would still fit perfectly and would not require any ironing too. The cloth pull zipper of Propper ACU jackets for sale makes it easy to open and close the jacket. Additionally the zip is unlikely to be damaged as it is covered. The fact that the jacket has no buttons waves off the worry of them falling off while crawling or carrying stuff around. This is made futile by the use of the hook and loop closures. The jacket also comes in a variety of shades that offer great camouflaging effects making it a great outfit while out for an adventure. The durability factor of Propper jackets (and their apparel in general) makes them stand-out from other military clothing brands. ACU jackets blends in with numerous environments and surrounds, particularly green foliage and rainy or foggy weather. It can be argued that the Propper ACU jackets for sale offer some of the best features compared to other field jackets on the market. The ranks of U.S. Army personnel are often worn on their military uniforms to distguish their status. Army rank patches are worn on shoulder (or in some cases the on sleeve) of the uniform. There are 9 levels of enlisted ranks in the U.S. Army. The first of the U.S. Army ranks commence with the Private and conclude with Sergeant Major of the Army. Alongside each proper Army rank name is the abbreviated rank identifier and the enlisted grade (or pay grade.) An enlisted grade begins at E1 and ends at E9. Grades E9, E8, E7 and E4 are distinguished since each of them has multiple ranks linked to them. Private, PV1, E1 is a basic recruit grade and rank. Their collar and sleeve are bare as they wear no insignia. Private, PV2, E2 wears insignia of one chevron on the collar and sleeves. Specialist 4, SP4, E4 is somewhat a unique rank. It is the only enlisted rank which doesn't bear rockers or chevrons. Instead, its rank is a solid shield with one eagle centered on it. Corporal, CPL, E4 wears the insignia of 2 chevrons. Sergeant, SGT, E5 sometimes referred to as 'Buck Sergeant', wears the insignia of 3 chevrons. Staff Sergeant, SSG, E6 wears insignia of 3 chevrons and one rocker. Sergeant First Class, E7 wears insignia of 3 chevrons and 2 rockers. Platoon Sergeant, E7 is of the same rank as Sergeant First Class and so wears the same number of Army rank patches- 3 chevrons and 2 rockers. Master Sergeant, E8 wears insignia of 3 chevrons and 3 rockers. First Sergeant, E8 wears insignia of 3 chevrons and 3 rockers but has more authority than Master Sergeant. One small diamond resides in the space of the rockers and chevrons. Sergeant Major, E9 wears 3 chevrons and 3 rockers. A small 5-pointed star resides inside the space of the rockers and chevrons. Command Sergeant Major, E9 wears a small 5-pointed star with a wreath within the space of 3 chevrons and 3 rockers. Sergeant Major of the Army, E9 is the highest enlisted rank and he represents all the Army enlisted soldiers. Centered between 2 5-pointed stars is the eagle from the United States Great Seal. This is centered horizontally within the 3 chevrons and 3 rockers. Each one of the U.S. Army rank insignia patches. There are specific patches for certain types of military uniforms, such as MultiCam or ACU Army rank patches. There are even rank patches in sew-on and Velcro options, depending on the standards of the Army or military branch. Each Army rank is special in its own unique way and holds a valuable position in the military hierarchy. Soldiers serving at any level of the order of military are equally as essential as their fellow service members even though their duties, responsibilities and ranks may vary.